THREE-TIME Oscar winner Meryl Streep will surely be nominated again as best actress for her mesmerizing title role performance in “Florence Foster Jenkins”, which you should watch right away as we don’t think it will last very long in our theaters. We watched it on its first screening to make sure we won’t miss it and there were only about 10 of us inside the theater. Her story has already been told in a play, a documentary and a biographical book. Now, it’s a full length period film. Set in New York in the 1940s, this is based on the true story of a wealthy socialite who aspired to be an opera singer and gained an odd, unusual kind of success even if she really cannot sing. When she strains for high notes like a screeching banshee, she sounds like a piece of corrugated iron being torn in half that can puncture anyone’s eardrums. Despite her awful singing voice, Florence comes out as someone charming and endearing on screen the way Meryl portrays her. She’s a passionate music lover and heartily supports the New York music scene, befriending music greats like the legendary conductor Arturo Toscanini. She actually reminds us of other people like her who are not really that gifted and talented, but still have some high aspirations for the arts. The difference is that she has the money she inherited from her father to indulge in her own whimsical ambition. Too bad for her the karaoke was not yet invented during her time, or she would probably have just settled for that. Because she’s moneyed, she has sort formed her own fans club and fed them generously with her favorite potato salad served liberally in bathtubs. She even has her own private club, the Verdi, where she stages her own shows, including one performance where she played an angel hanging from the ceiling while some men are having a hard time pulling her up as she’s quite fat. She gives recitals where the audience members are “hakotees” by her husband and her ultimate goal is to sing at the prestigious Carnegie Hall. 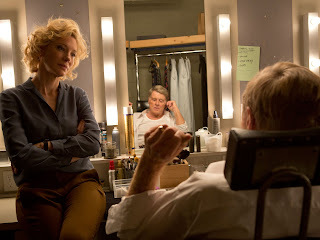 Meryl shows another astonishing chameleonic transformation as Florence, something like her similarly stunning performances as Margaret Thatcher, Julia Child, Lindy Chamberlain, Rikki Rendazzo, Miranda Priestly, among others. She truly nails the role, without ever going over the top. She makes Florence quite endearing as a not so gifted 76-year old woman who desperately wants to share her intense passion for music with other people. She is made to look older and fatter in the role, using a wig to cover her balding head. In the end credits, an actual recording of the real Florence is played and we see how successful Meryl is in aping the way Florence sings that badly. 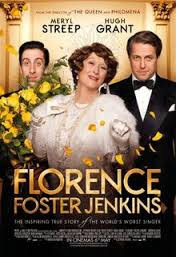 Not to be outdone is Simon Helberg (the TV actor from “Big Bang Theory”) as Cosme McMoon, Florence’s shy but loyal pianist who accompanies her when she sings. 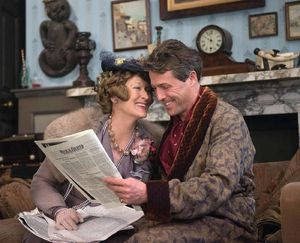 At first, he has to stifle his laughter while listening to Florence’s horrible singing as an operatic soprano, but eventually, he cultivates some fondness for Florence as seen in their very poignant Chopin piano concerto duet where it’s clear they’ve already made a connection when the affectionate Florence visits him in his humble home. The film is set in the last few months of Florence’s life and becomes quite sentimental towards the end. The scene where Bayfield puts her to bed, reciting some lines from Shakespeare like a lullaby, then carefully removing her wig and her lashes, is simply very touching. It’s clear that she is sick and it’s so poignant when we learn she got it from her first husband when she was only 18 years old. The film never really makes fun of Florence. We get to know her more intimately even before her atrocious singing starts. By that time, we already know she’s really a kind and good-hearted person so we tend to sympathize with her, despite her bad singing. This film is definitely worth watching and is surely a great alternative in these days when we see nothing but sequels and superhero fantasy movies.